Please see our return policy for regular (non-trial) orders. Please see our return policy for Economy jar orders. If you have any questions, please contact support@ultimatecaninehealth.com. 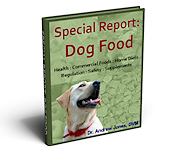 "Special Report on Dog Food"
Get my FREE e-Book and FREE 7 Day Email Course - just enter your name and email below!